How much would you pay to sleep more soundly each night so that you wake up rested and ready to face the day? 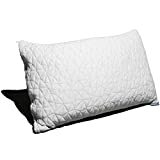 Well don’t worry about breaking the bank, because all you need is a single $60 pillow available right now on Amazon. The Coop Home Goods Premium Shredded Hypoallergenic Certipur Memory Foam Pillow is like nothing you’ve every tried before. Instead of getting a crummy new pillow every few months from your local Bed Bath & Beyond, pick up a pair of these puppies on Amazon and you’re sleep like you’ve never slept before. Pro tip: Remove the cover and toss the pillow in your dryer on no heat for 15 minutes before you use it for the first time. BACKED BY THE COOP HOME GOODS GUARANTEE – We guarantee you’ll love the pillow, and if you aren’t absolutely satisfied, return it within 30 days for a refund, no questions asked.